This post is sponsored by the makers of ibi. I still remember fondly sitting in the living room with my family as my dad pulled out the slide projector and adjusted the screen. Then he’d go through the latest reel of slides from our summer vacation out in Cape Cod. Usually this’d happen when either my cousins were over or family friends were visiting. I guess you could say that was the precursor to someone’s Facebook wall these days. Don’t get me wrong. I absolutely love technology! I can be at my son’s baseball game and quickly text a photo of Ryan up at bat to my parents and sister. Or I can whip out my phone at Thanksgiving and show my in-laws the final competition from Jason’s robotics team. Capturing life’s moments has never been easier. Sharing and organizing life’s moments, well, that’s a different story. I have thousands, literally thousands of digital photos. 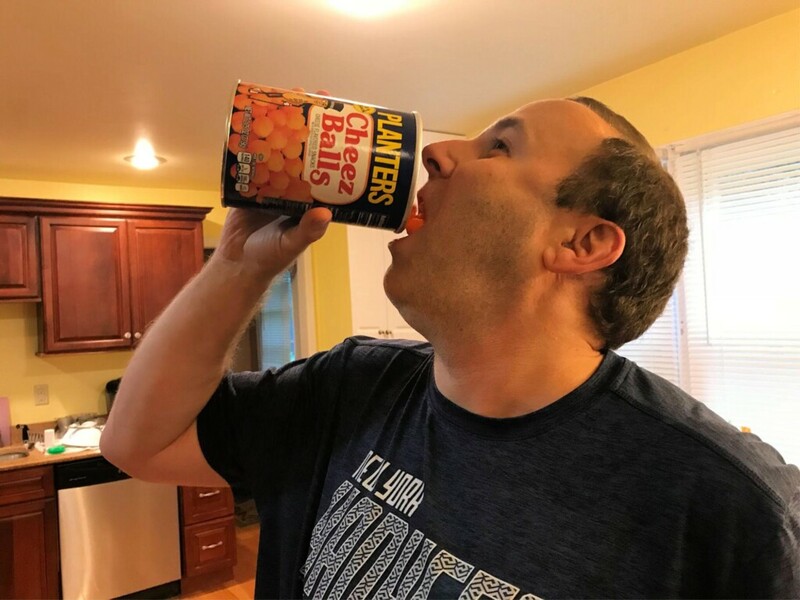 From family vacations to school concerts to…well, yes, me stuffing my face with Planters cheez balls. But they’re all over the place. As I’m sure your photos are too! I have pics on Facebook, Instagram and Twitter. Oh, and Pinterest too. Then there’s my computer and my wife’s computer. And my iPad. And my iPhone. And the Cloud. And in text messages I’ve sent, since for some reason they don’t automatically save to my iPhone. You get the picture. I have photos, they’re just all over the place. It’s a total mess and when I do want to share with everyone, it’s easy to toss on social media. But when I want to share with just a select group of friends and family, well, then it becomes an exercise in sending zillions of text messages. At least, that’s how it used to be. But my photo world just got a lot friendlier thanks to my newest BFF. It’s the cutest little buddy a guy could ever ask for. His name is ibi and he’s a life saver. Officially, ibi is a “smart photo manager.” And I certainly wouldn’t argue with that. It’s also the cure for the common craziness that engulfs all of us when it comes to photos. Super simple to use (there are literally just 2 ports in the back: 1 for power and the other for a USB cord), ibi will collect all of your photos and videos from as many nooks and crannies as you have them stored in, and combine them into one organized place. 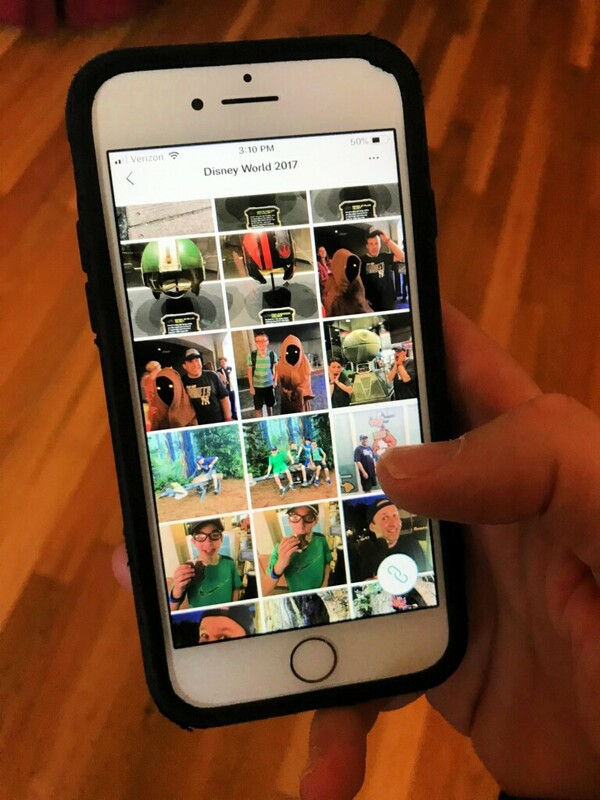 Once your photos are safely snuggled up in one place, you can easily search for specific images or videos by date, location or keyword. 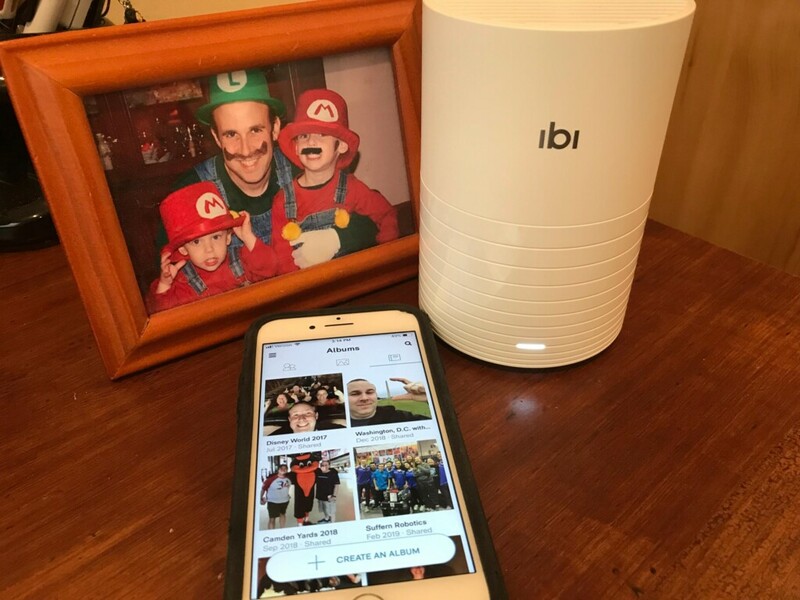 But the best part of all, is that with ibi, you can privately share specific photos or photo albums with anyone or groups of anyone that you’d like. I’m putting together my Inner Circle (immediate family and closest friends) for ibi. That way, I can invite whoever I want to my Inner Circle and they’ll easily see anything I share in that area. It’s all easy to manage via the ibi app on your smartphone, whether it’s an iPhone or Android model. Now I can automatically send all the pics I take on my iPhone directly to ibi. 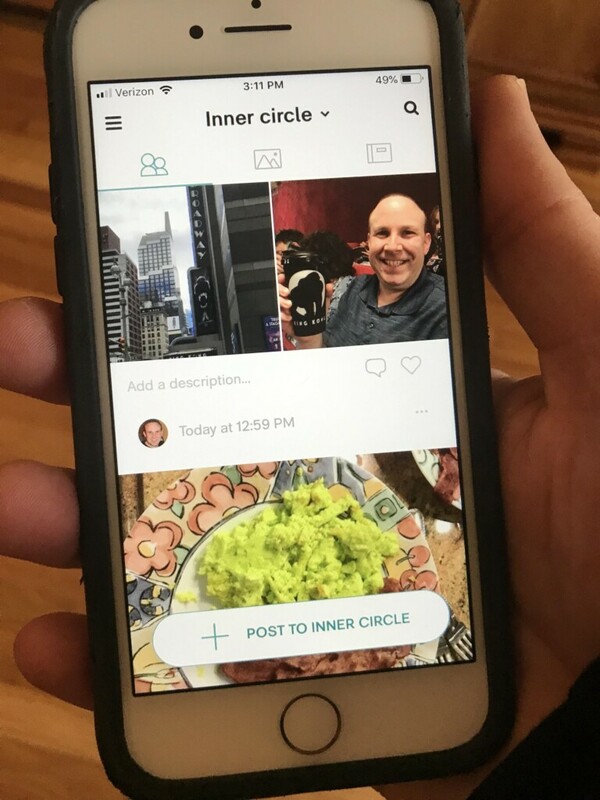 Then via the ibi app, I can pick and choose what I want to quickly share to my Inner Circle. Yes, I apparently have “people” now and can let them in on the full photo documentation of my life! But there’s so much more than just sharing what you want with your closest friends. 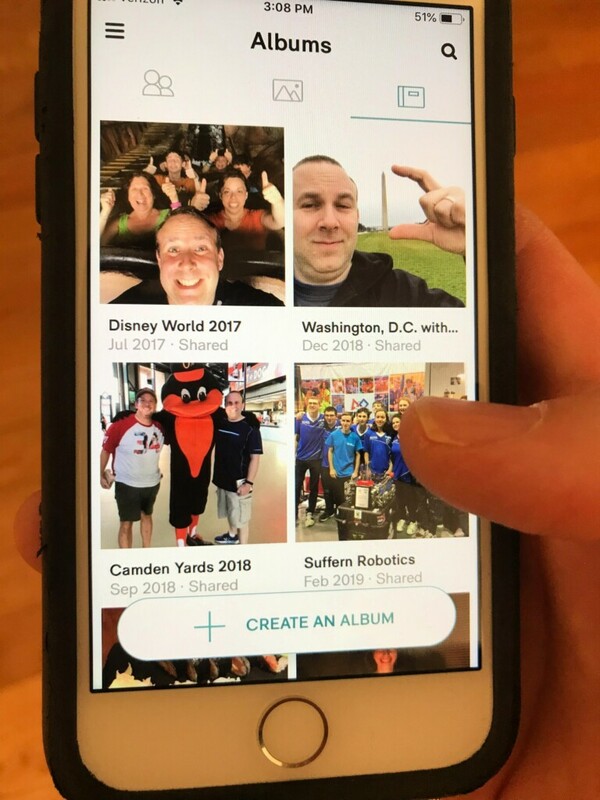 You can also create and share photo albums with anyone you want! What’s nice is I have oodles of pics from our trip to Disney World a few years back. We went with my wife’s cousins for about a week and must have taken 90,000 photos. 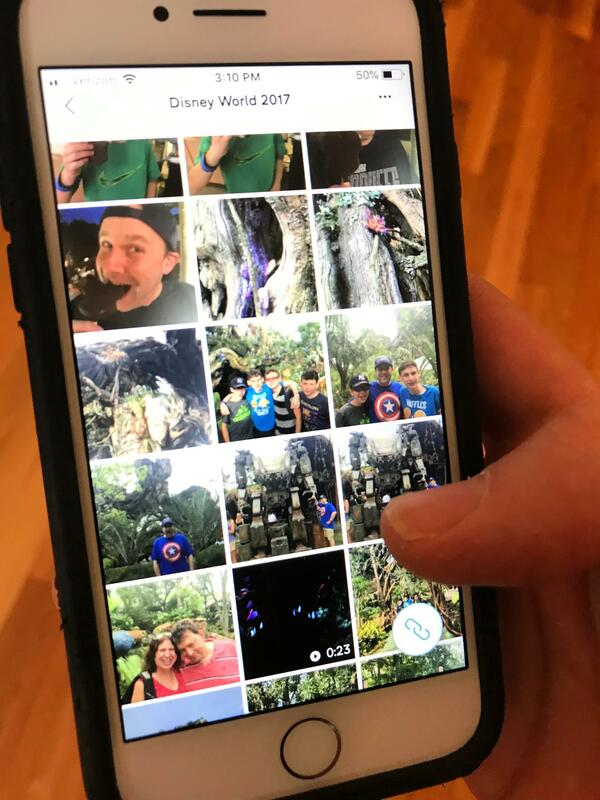 Rather than dig through every photo I have to put together the perfect album to print out (which we do still want to do), I simply created a Disney World 2017 album and via my iPhone, put all the Disney pics in there. 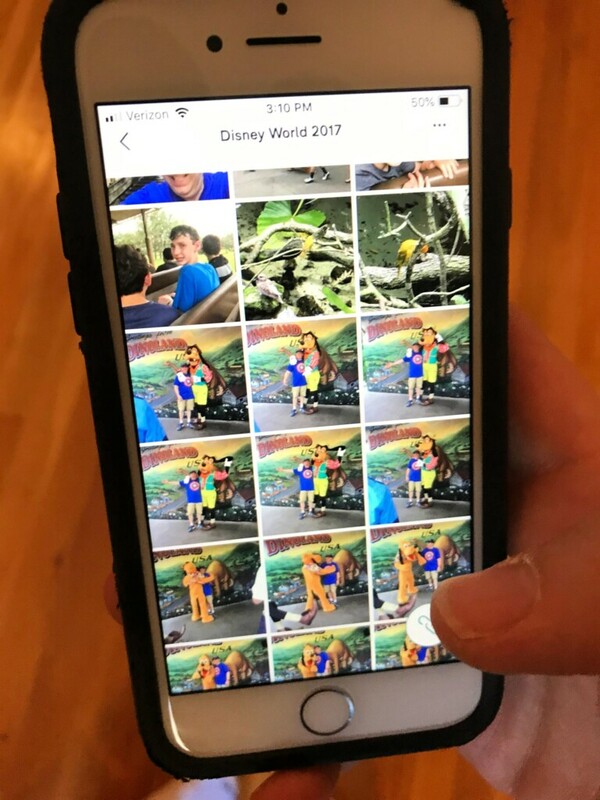 By inviting Allie’s cousin Ivy to the album, she (and her family when I add them), can not only access the Disney World 2017 album to view every single photo, but they can add to it as well! That way we’re all easily sharing our Disney pics in one communal place. My college buddy Dave and I try to get together at least once every year. Usually we meet in Philadelphia because it’s the halfway point between our homes. Last year we decided to meet up in Baltimore, as it’s close to his home but there happened to be a big Baltimore comic convention going on that weekend. So we bought comics and went to an Orioles game at Camden yards. 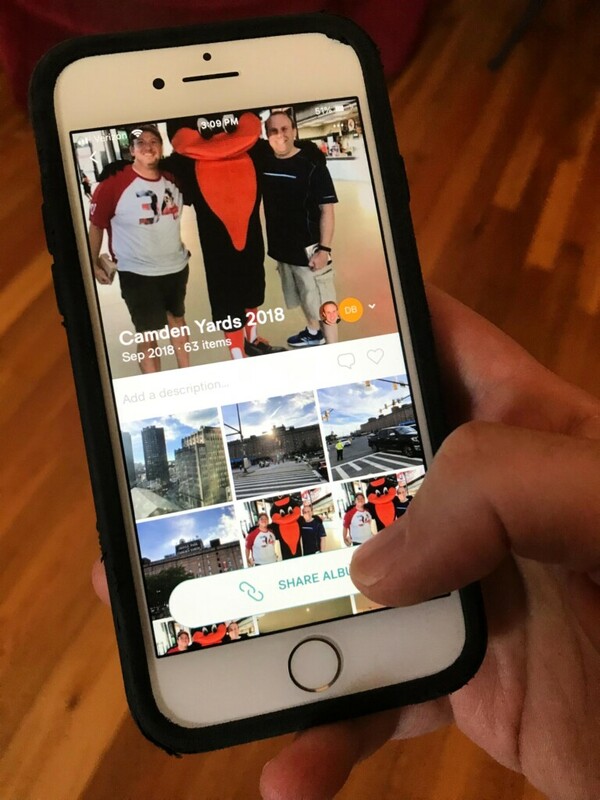 I took loads of fun pics and just shared my Baltimore album with Dave. He can laugh at our ridiculousness and add his cheesy photos to the group as well. I wish I remembered this bird’s name. 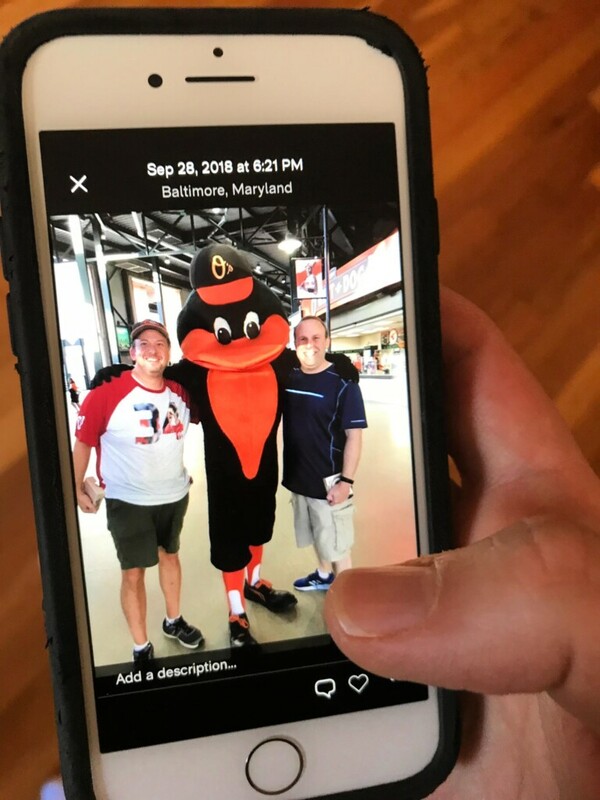 But it’s the Orioles mascot who we had to chase down around the stadium just to snag this pic. Then there are all the school concerts that the kids are in. My parents live up in Albany, NY so they usually don’t get to see Jason play his viola in the String Extravaganza or Ryan strum his guitar. But thanks to ibi, I can either share those concert pics and videos with the inner circle, or just create a concert album and share it with the boys’ grandparents. Same goes with basketball games. Baseball games. Birthday parties. Holidays. Virtually anything you want to bring the family in on, is game. I think you’re starting to get the picture (no pun intended!) here. With ibi, I can easily organize my chaotic photo libraries and instantly share with whomever I want. That means precious moments that me and my family face every day can be shared with our loved ones, without me having to blast them to the world on social media. 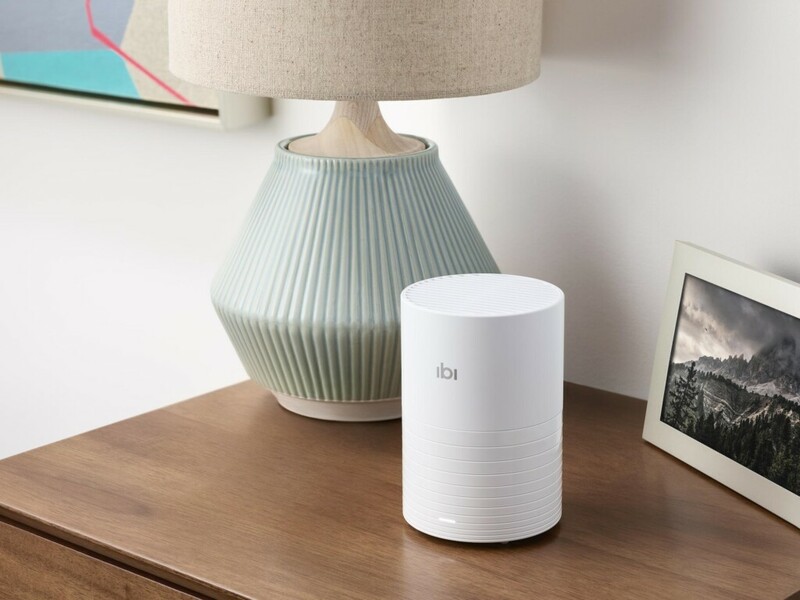 For some real fun, the next time the family is over, I’m going to take out my phone, open up the ibi app and cast the albums onto our smart HDTV. That way we can all enjoy our photo memories together in the same vein as I did when I was a kid. Except, unlike dad, I won’t have to worry about there being any holes in the screen.